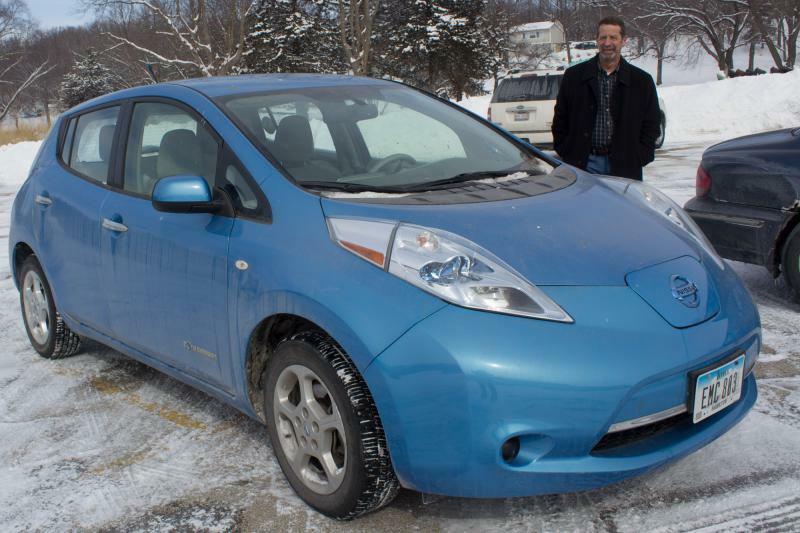 Nissan Leaf owner Rand Faaborg demonstrates how he attaches the electric cord to his car. The other end can be plugged into any standard 110-volt outlet. 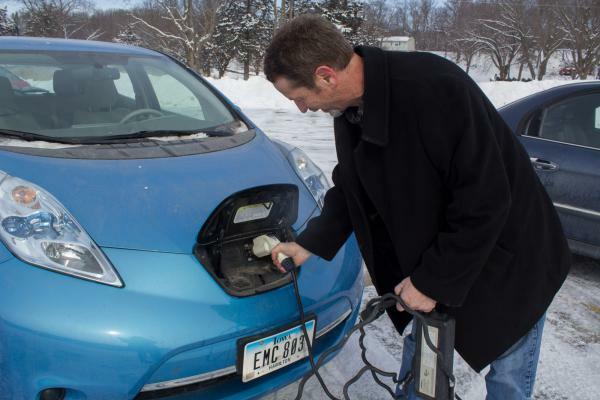 One million electric cars were sold in the U.S. in 2018, and while states with stricter emissions standards, such as California and Oregon, lead the way, plenty can be seen on the road even in central Iowa, where corn has long been king. About 40 percent of the corn grown in the United States gets turned into ethanol for gasoline, but the demand to reduce fossil-fuel emissions could bring pretty drastic changes to agriculture in the Corn Belt. Think acres of corn replaced by perennial crops or the return of small grains such as oats and wheat. Harvest Public Media's Amy Mayer tells how the electric car trend could change farming. Lee Tesdell is all-in for reducing his carbon footprint. He began installing solar panels on his farm in Polk County, Iowa, in 2013. 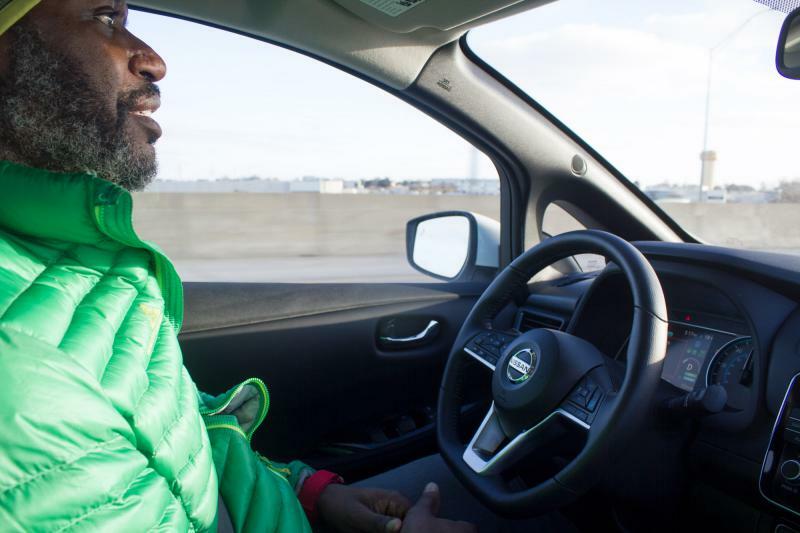 In December, he bought an all-electric Chevy Bolt for his commute. 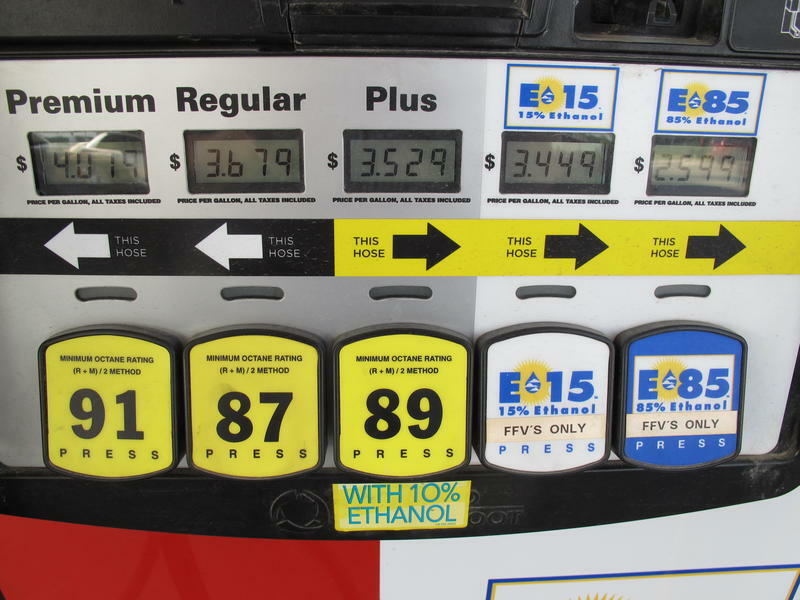 Government-backed ethanol has been a boon to corn farmers, but Tesdell said it’s led to overproduction, which in turn has kept corn prices low the past several years. “I would like to see corn acres reduced by quite a lot in Iowa and more diversification,” Tesdell said. He’s doing that himself, with a variety of conservation practices as well as raising sheep and growing alfalfa. He also has dozens of acres he rents out to a farmer who plants corn and soybeans. They’ve discussed other possible crops, such as industrial hemp or cereal rye for cover crop seed, but they’re still in the research stage. It’s risky and can be hugely expensive to change a crop rotation. Transitioning away from corn and into alternative crops could have multiple benefits for farmers and the environment. First, from a business standpoint, farmers need to anticipate market changes, according to Trevor Russell, water program director at Friends of the Mississippi River, an environmental nonprofit. And secondly, different crops like kernza wheat or the oilseed camelina could help clean up polluted waterways and nurture depleted soils. But Russell said it’s going to take the same types of government policies and incentives that expanded ethanol to establish viable markets for other crops. Without those, farmers – and their creditors – won’t see new crops as potentially profitable and won’t be able to invest in the necessary changes. Russell is actively forming partnerships with agricultural groups and said his advocacy for water quality has morphed into an agriculture policy job as he works to help develop these new markets. He said he feels a sense of urgency, too, because even though no one can predict the timeline for the transition to electric cars, it’s clearly underway. 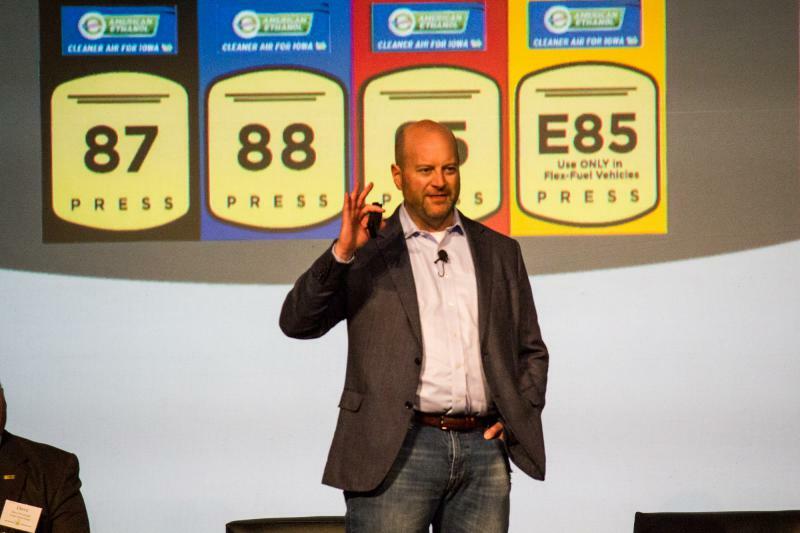 John Eichberger of the Washington, D.C.-based Fuels Institute attended the 2019 Iowa Renewable Fuels Summit to discuss what he foresees in the transition to electric cars. He told ethanol-industry experts not to panic … yet. That’s something Rand Faaborg knows well. He’s a welder by trade and commutes 20 miles one-way past acres and acres of corn fields every day in a used 2012 Nissan Leaf. But he also raises hogs and cattle, and charges the car in his barn. “I have several trucks, cars, tractors. 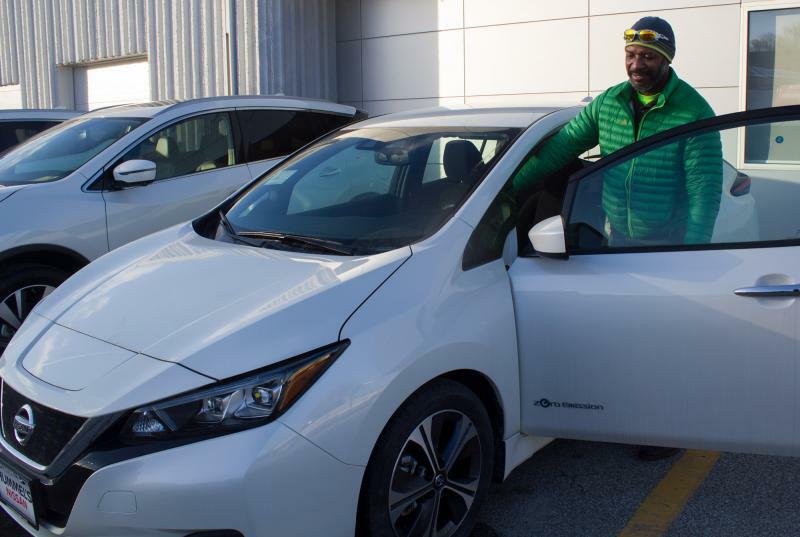 I still use a lot of gas,” said Faaborg, who joked that no one predicted he’d be the first one in the work parking lot with an electric vehicle. He’s proud of his rural Iowa roots; his father-in-law and daughter also farm. Faaborg is equally confident farmers will be able to adapt to an eventual reduced market for corn, and in the end, he predicted, everybody will win. This story was reported, in part, with support from the Institute for Journalism and Natural Resources.